Valves are clavate-lanceolate, broadest at the central area, which is positioned slightly toward the headpole. Valve ends are unprotracted. The headpole end of the valve has convex margins. The headpole is rounded, more acutely in smaller specimens. The footpole end of the valve has straight margins, which narrow to an acutely rounded footpole. A small pseudoseptum is evident at the footpole. The valve face-mantle junction appears to be rounded. The axial area is lanceolate, about 1/3 breadth midway toward the valve ends, expanded to a broader apically elliptic central area that is bounded by short, evenly spaced striae. A single stigmoid is located in an oval depression in the central area, distant from and unassociated with the striae, positioned close to the proximal raphe ends. Raphe is filiform and straight. The headpole raphe terminus initially deflected toward stigmoid side of valve before returning to a medial position. Proximal raphe ends are closely spaced, proximal ends are sharply reflexed toward the stigmoid in deep focus. At the valve center, striae are subparallel. Toward the footpole, striae become slightly radiate.Toward the headpole, striae become slightly radiate before becoming subparallel to slightly convergent. Areolae are relatively coarse, apically elongate, usually discernible in LM, 25.6-32.8 in 10 µm. 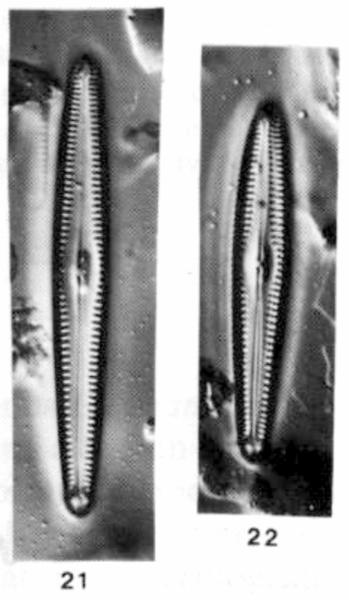 A large apical pore field split by raphe end is evident at the footpole. There are several problems with determining the identity of this taxon. In the original description (Lowe & Kociolek 1984, p 472, Figs 21-22): 1) no scale bar is provided on the illustrated specimens; 2) the illustrated specimens do not correspond to the holotype specimen that is circled on ANSP GC-53921; 3) the circled type specimen (identified above) does not closely correspond to the description (circled type is only 37 µm long); 4) the population of specimens on the type slide differs from the original description by having smaller size (35-54 µm rather than 45-70 µm) and higher stria density (12-1-14.5 in 10 µm rather than 10-11 in 10 µm). 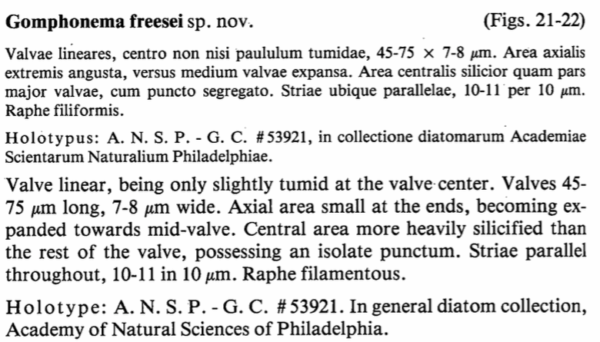 Because ANSP GC-53921 is clearly designated as the type we must defer to the circled type specimen and use the range of taxa on the type slide as a starting point to define this taxon. Other reports of this taxon (e.g., Thomas & Kociolek 2009, Figs 106-108) appear to more closely follow the illustrated specimens in Lowe & Kociolek (1984) rather than the type material. This species was originally described from the Abrams Creek watershed (Great Smoky Mountains National Park, Tennessee) as an epiphyte on the aquatic moss Fontinalis. Valve linear, being only slightly tumid and the valve center. Valves 45-75 µm long, 7-8 µm wide. Axial area small at the ends, becoming expanded towards mid-valve. Central area more heavily silicified than the rest of the valve, possessing an isolate punctum. 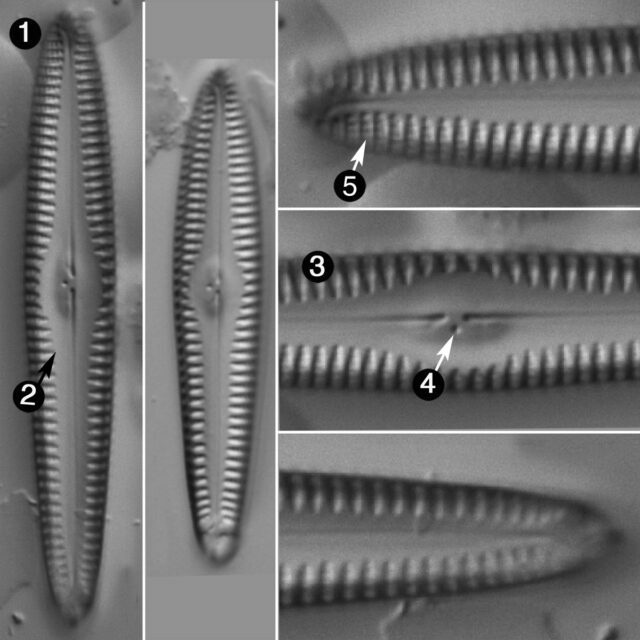 Striae parallel throughout, 10-11 in 10 µm. Raphe filamentous.